This was fun. 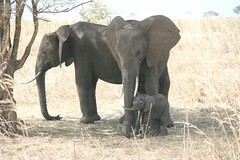 Just at 20m, 2 female Elephants with a baby Elephant walking around. It was just a few days old! Day 51: Selous c'est ou?